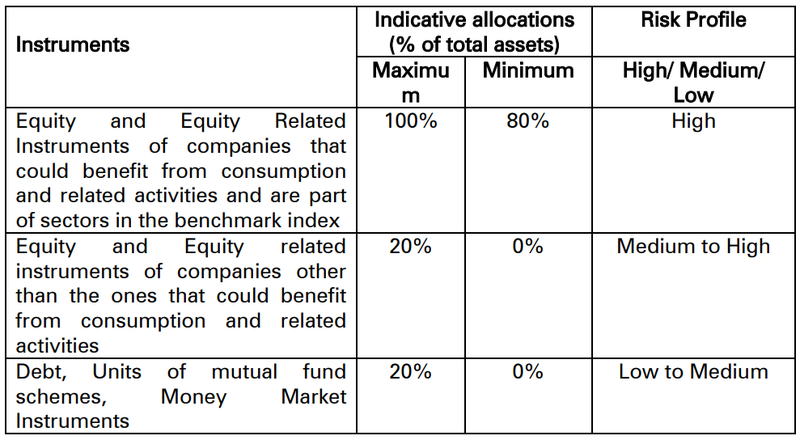 ICICI PRUDENTIAL BHARAT CONSUMPTION FUND – SERIES 4 is a Close Ended Equity Scheme following Consumption Theme. The performance of the Scheme would be benchmarked against Nifty India Consumption Index. The investment objective of the Scheme is to provide capital appreciation by investing predominantly in equity and equity related instruments of sectors that could benefit from growth in consumption and related activities. However, there can be no assurance or guarantee that the investment objective of the Scheme would be achieved. 1/ Mr. Sankaran Naren has over 27 years of experience in Fund Management, Equity Research, Operations etc. He was designated as Co Head – Equities from October, 2004 till February 2008 at ICICI Prudential Asset Management Company Limited. He has been designated as Executive Director of ICICI Prudential Asset Management Company with effect from April 22, 2016 to till date. 2/ Mr.Rajat Chandak has around 9 years of experience in fund management/ research analysis. He is associated with ICICI Prudential Asset Management Company Limited from May 2008 till date. 3/ Ms. Priyanka Khandelwal is associated with ICICI Prudential Asset Management Company from October 2014. Go to Explore Funds and then click on NFO to see all the NFOs listed on Kuvera at any given moment. Enter the amount online and pay for it using net banking – just like any other lumpsum investment on Kuvera. Easy as that! If your favorite NFO is not available, then email us at [email protected] and we will add it online.